I picked up this month’s selection – Adam Rifkin’s new film Look – at Eyesore when I was there renting Burial Ground a few weeks back. 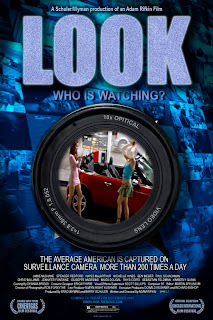 Using the off-putting statistic that the average American is photographed two hundred times a day as a reference point, Look is an ensemble piece that is told entirely through the use of survaillance cameras. Adam Rifkin was a name I recognized, but couldn’t place. It turns out he’s been in the business since the eighties and has directed notable films like The Chase and Detroit Rock City. Coincidentally, Rifkin also worked on The Nutt House, which is a film that Sam Raimi, Bruce Campbell and Scott Spiegel were involved with, but had their names removed from after Speigel was replaced by Rifkin as director. I still haven’t been able to get my hands on that. As for Look, once I got over the realization that it was obviously scripted and not actual footage, I enjoyed it quite a bit. It is immediately captivating and not just because the first scene shows the inside of a department store change room. Rifkin does a nice job of playing overseer. You really get the sense that someone has culled a narrative out of millions of hours of footage around this city. The subject matter runs the gamut from sometimes funny (two buddies joking around in a convenience store), sometimes awkward (a student’s escalated flirting with her teacher) and sometimes disturbing (a man stalking young girls at a mall). Despite some familiar faces like Giuseppe Andrews (Cabin Fever) and Rhys Coiro (TV’s Entourage), there are no huge stars to break the illusion of quasi-realism. It is a testament to these naturalistic performances that even with the sterile camerawork, the situations still feel genuine. I guess this shouldn’t be a surprise, as these scenarios do occur and voyeurism is one of our more primal instincts. Look is worth checking out. If you are fan of films with unique narratives (like 2000’s Time Code or Chris Nolan’s early work) then you should find this as fascinating as I did. I quickly devoured the ample special features on the disc after my initial view and MAY have watched the first scene an unhealthy number of times… but hey – you can’t prove anything!